South Bank is a stunning riverside stretch centrally located minutes from Trafalgar Square, Covent Garden and The Houses of Parliament. The area is well-served by public transport and car parking, and is the perfect place to explore on foot. Needless to say there's no advice to encourage people to get here on a bicycle. 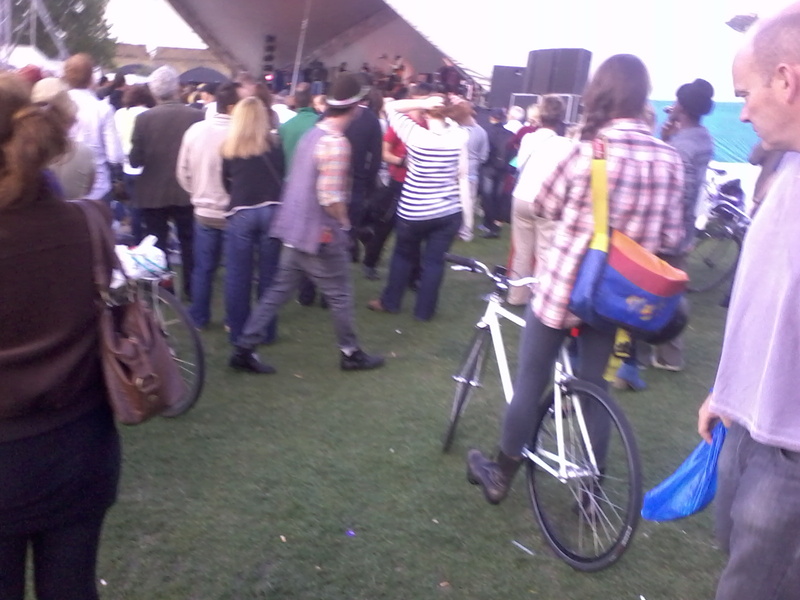 Why isn't the cyclist shopping? 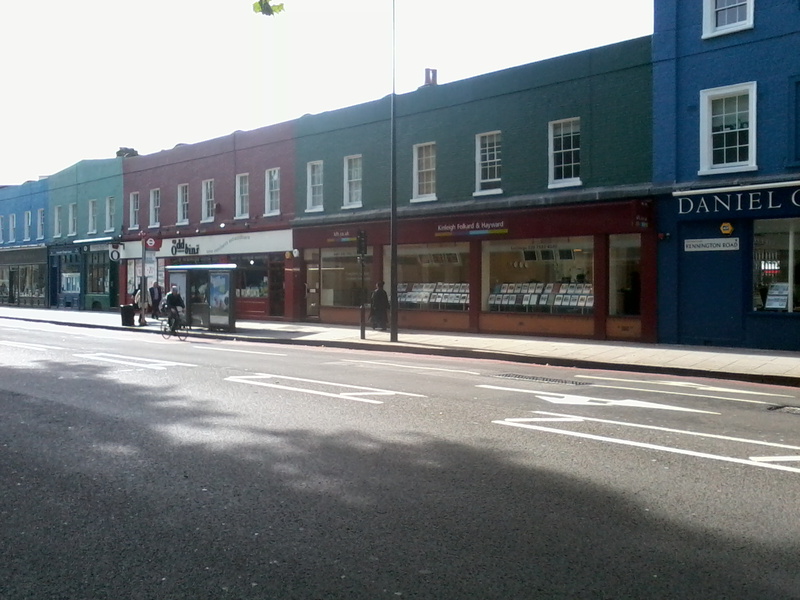 Kennington Road is used by hundreds, if not thousands, of people on bikes everyday. Like other people, they probably like to browse in a bookshop, get food from a deli, check out the estate agent's window or buy a bottle of wine. 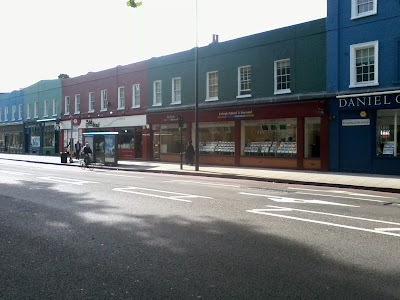 So why don't these people on bikes (like the person cycling past the bus stop in the photo) ever stop here to nip into a shop? It's the same simple reason these people on bikes never stop to shop on the other side of the road either - there are no signposts that you can fit a D-lock around to park a bike, no railings and no cycle parking stands. 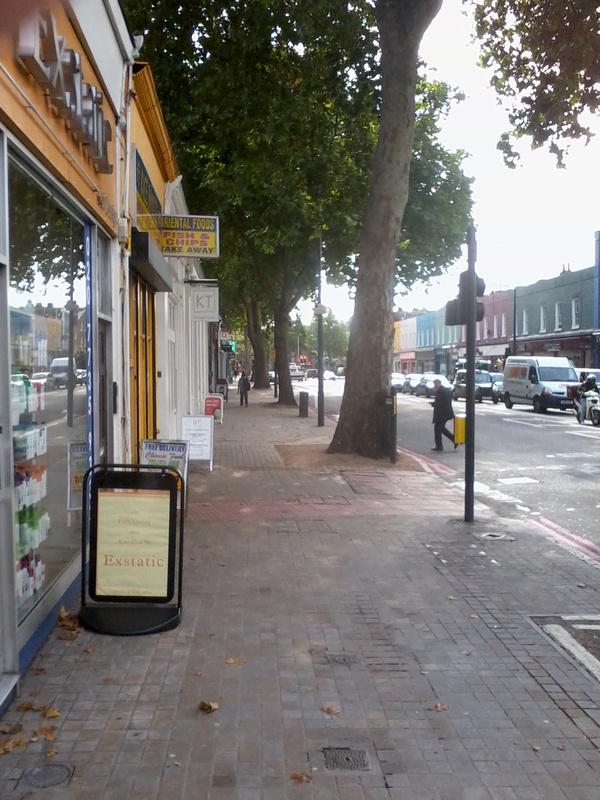 The number of A-frame advertising boards on the pavements suggests the retailers are desperate for passing trade. Just imagine if the retailers had invested in Sheffield Stands instead of A-frames - what a wealthier bunch they would be. 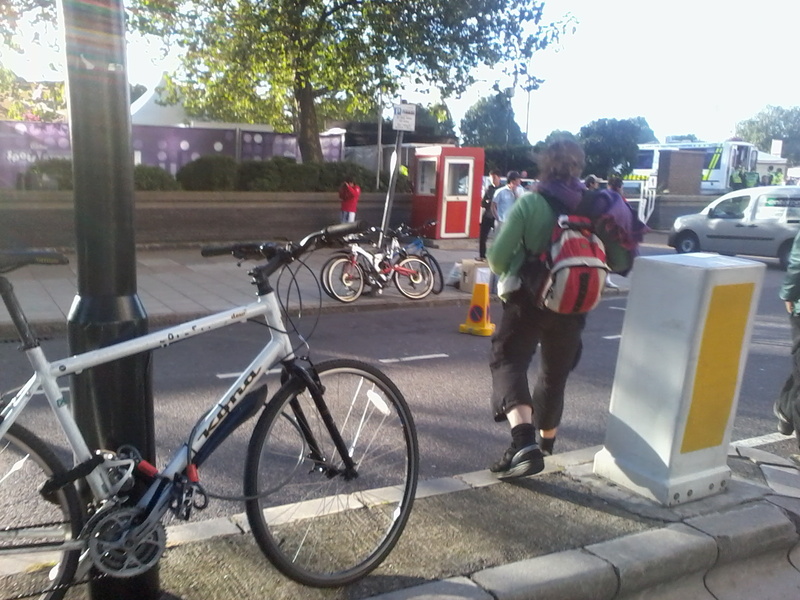 It is, of course, more pleasant to walk and cycle without being pressured by motor traffic. Yet many people believe there is no alternative to large numbers of fast moving vehicles delivering stuff. The irony is that much of the stuff being driven around isn't actually needed. The photo is of the indoor cafe at the Imperial War Museum, one of the areas many tourist destinations. This isn't a take-away kind of cafe and there's plenty of seating. So there's no need to use once-only lifetime stuff (drive it in, use it once, bin it, drive it out). Why are there stacks of one-use glasses rather than glass or reusable plastic ones? Why are the serviettes displayed in a 'grab a handful' way, rather than in a single serviette dispenser? In fact, why not have washable napkins? 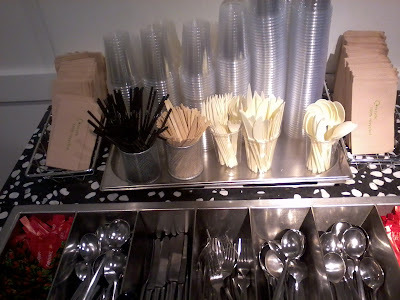 Why are there plastic knives, forks and spoons when there are metal ones just below? 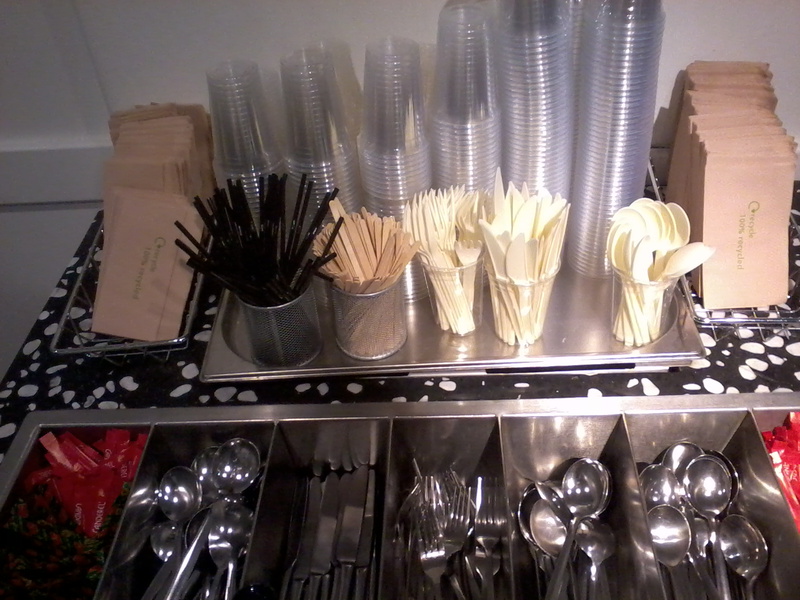 Why ever would you have wooden drink stirrers when there are teaspoons just below? Surely there must be reusable straws available? These kind of establishments normally burble on about lack of space for proper crockery and dishwashers, yet have shed loads of bin space that could serve a more useful purpose. What they can't fit in their bins they arrange to have driven around on our streets to our discomfort. 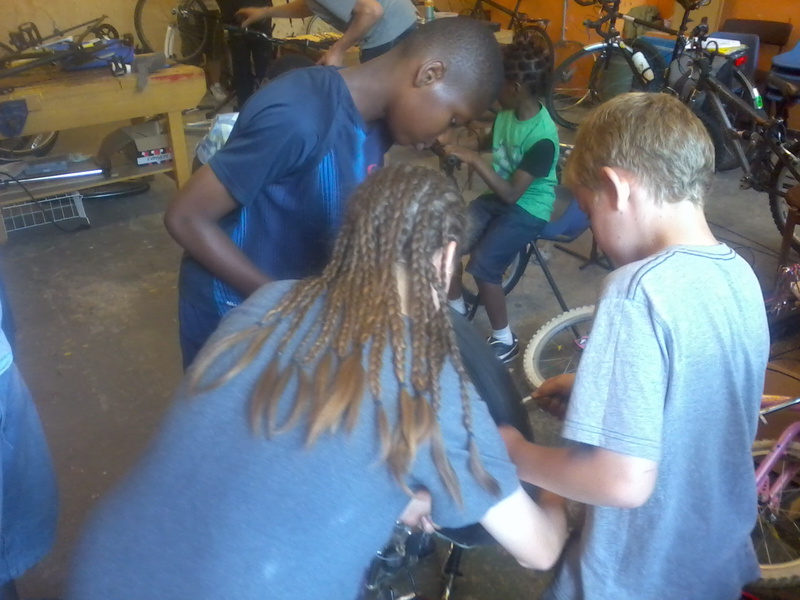 Cycle maintenance by 10-16 years is taking off at Pedal Power Kennington at the Lilian Baylis Community Hub - to the point that bike repairs are spreading beyond the former classroom. It's great to be getting a regular group plus new arrivals each week - and adult volunteers who are helping (hats off to Dave, Sally, Marcel and Trevor). 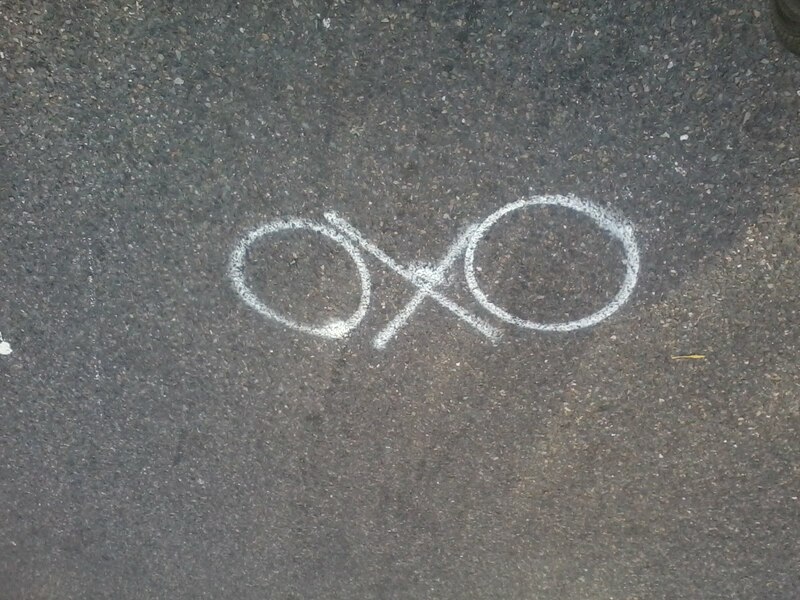 Lots of temporary OXOs, baby cycle logos, have been arriving on local streets, as part of Lambeth's Local Implementation Plan fund from TfL. It backs other measures which result of Lambeth taking advantage of the opportunity for boroughs to bid for complementary measures funding - a positive add on to the Cycle Hire scheme. 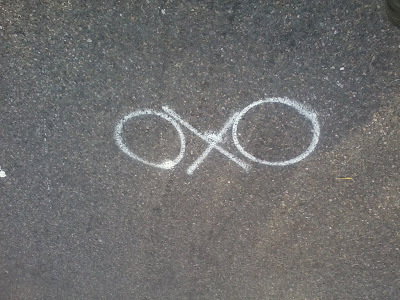 In the centre of lanes the finished cycle logos reinforce to people on bikes the correct place to ride, while reminding drivers to expect to find people cycling along. We know it was inconvenient for cyclists but there really was not another solution. Advance warning signs were issued over two weeks before the road and path were closed and were placed at regular intervals along appropriate roads and paths (including the cycle path that was closed). As I'm a frequent but not a regular user of the path I can't comment on the preceeding fortnight. But I've asked for clarification of where a sign is in the photo I took above showing the cycle path entrance which led to the barricaded section - no reply yet. Thank you for sending through your feedback and we will consider what we can do to better inform cyclists for any future events we may do. Nothing about how to avoid the level of inconvenience. I think these organisers of a 'green' event really believe that people want to cycle on the road with stinking, speeding taxis - despite all the evidence to the contrary. A Lambeth Cyclists course run by a Brixton Cycles mechanic. Five Wednesdays, starting October 13th, 6.45pm – 8.45pm. Last Friday was a damp, autumnal day - but not something to deter the illegal traders on the red route/bus lane/cycle lane on Westminster Bridge. I'd been noticing them continue to trade over the previous several days and so it was time for another quick photo. And, given the abject failure by Transparking for London to block these organised criminals, I thought I'd better have a look at the new Superficial Highway which was always parked on by Waterloo Cars when it was a green cycle route, and now it's blue... it's still always parked on by the LICENSED minicab drivers. The two pedal police I spoke to who were lurking by the junction today told me they were there to catch cyclists jumping the red lights and, of course, parking by 'professional' drivers in a mandatory cycle lane on a yellow line was not the sort of crime that concerned them. `Draft South Bank and Waterloo Cycle Strategy', September 2010. Lambeth Cyclists, the borough group of London Cycling Campaign, are pleased to have been invited to comment on the draft report which the London Borough of Lambeth commissioned SBEG to write. The commission was to make recommendations about the development of cycling at a neighbourhood level in the South Bank and Waterloo area. While we applaud the considerable amount of work has gone into presenting a lengthy draft document, some of which is very good, we consider that a further draft needs to be produced. In large part the present draft appears to focus on `rationalising' or to some extent accommodating increasing levels of cycling rather than actively developing it. The final draft must have a vision for developing cycling. The present draft superficially acknowledges the hugely increased number of people using the area and the South Bank's coming of age as a part of central London, but totally fails to address the unacceptable dominance of the motor-vehicle in the area of study (in common with much more of central London) as THE principal issue to be addressed. This can be clearly seen in the way that the draft strategy makes no recommendations with regard to Westminster, Waterloo or Blackfriars Bridges and their respective junctions – though all are within the area of study as shown in the map on page 14 and all feature major obstacles to encouraging active travel. `Developing active travel and reducing motor-traffic volume and speed within the South Bank and Waterloo'. We are also concerned that, if we understand the footnote on P8 correctly, logical ways of developing cycling in the area have been excluded due to restrictions arising from the London Eye S106 monies used to fund the `South Bank Cycling Strategy'. If this is the case the report needs to be retitled, perhaps to `A Partial Contribution to a South Bank and Waterloo Cycle Strategy'. Clearly it would be better to either secure additional funding or bend the rules in order to be able to write a proper strategy. The restrictions may explain why the local schools – whose pupils would benefit hugely from seriously improved cycling conditions - were not represented on the steering group when they clearly should be. We have taken Counsel that suggests the statement in the strategy that `it is technically illegal to cycle on the River Walk' is incorrect. The report needs to give full details of the law(s) allegedly being broken by cycling and whether these apply to the full extent of the River Walk or specific parts. Additionally, we note that the draft has been poorly proofed which makes it difficult to understand – one chart was wrongly reproduced (p26,27), several paragraphs are repeated, several statistics are very questionable (eg p34 various figures; p60 assertion of 24,900 employees at Waterloo Station) and several of the charts don't have axis labels explaining what they represent. a) Rationalising cycle provision and routes – this heading should be Enhancing cycle provision and routes. We examine this in detail further below. 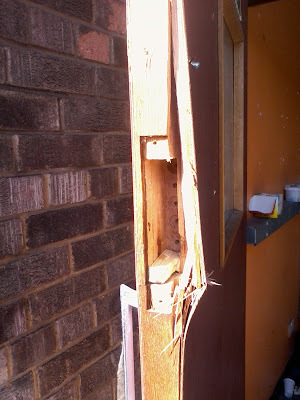 b) Crime Reduction – We would prefer all the existing content of this to be within a sub-heading `Cycle Theft Crime Reduction' as the recommendations given exclusively relate to this aspect of crime. We support the measures proposed. An additional sub-heading is needed relating to enforcement of traffic law – with crimes such as careless driving, wanton and furious driving (incl. cycling), speeding, parking on red-routes on a cycle and bus lane; driving and parking on the pavement, and illegal use of Advanced Stop Lines by drivers being targeted. c) Workplace Travel Planning – we encourage companies to write and implement travel plans that encourage active and sustainable travel by their employees but also by their suppliers and customers/visitors. We consider it unacceptable that the measures recommended here only relate to employees. 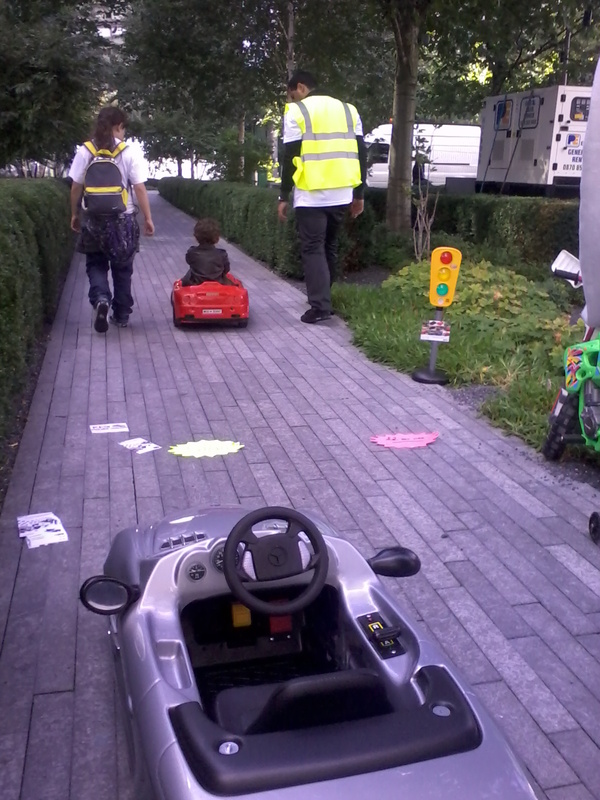 The workplaces need to be working to find ways of reducing the need for deliveries by motor vehicle (e.g. 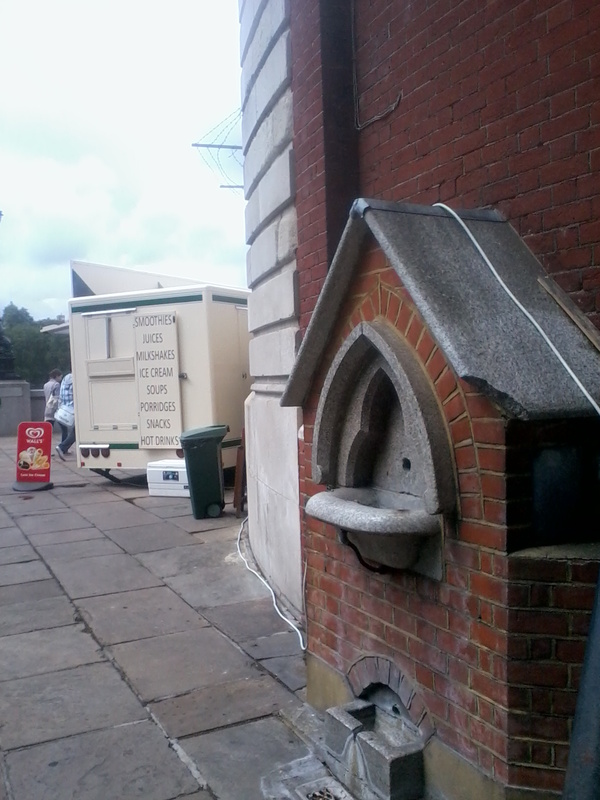 providing drinking water fountains and taps for customers, visitors and staff rather than bottled water; and, reducing visitor parking and discouraging taxi use but instead promoting public transport and active travel). d) Programme of Education – we support the measures proposed here. 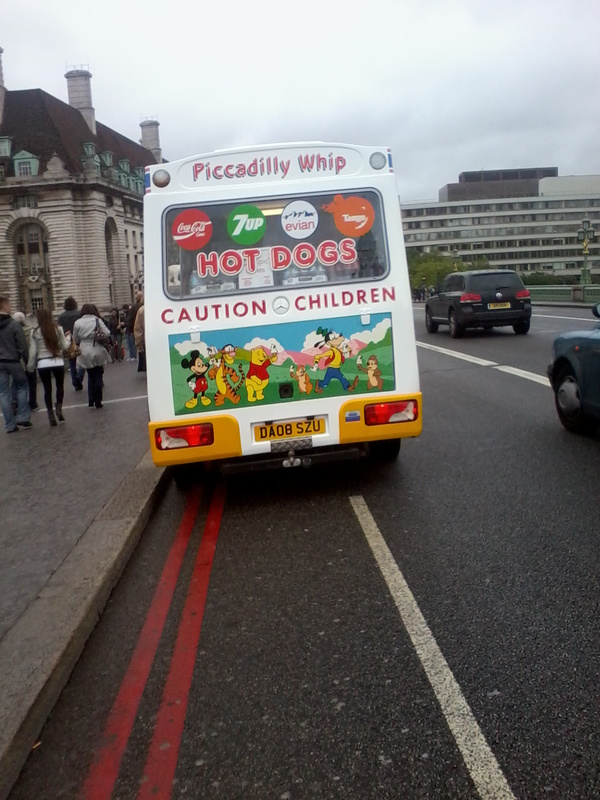 Within the area of `Cycling and Driving Behaviour', cycle awareness training should also be provided to drivers of the many smaller commercial vehicles that form a large part of the local motor-traffic: taxis, mini-cabs, and delivery, maintenance and ice-cream vans. e) Other initiatives – Rather than a `sustainable transport group' we recommend establishing an `active and sustainable transport group'. We support the other aspects. 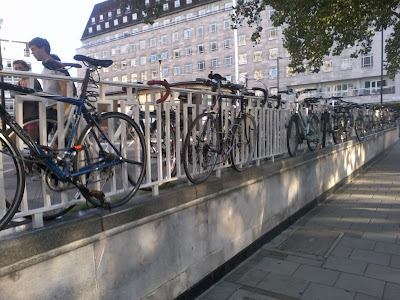 The whole report suffers from being written in a way that suggests people on bikes should only use designated cycle routes, and through this blindness omits to make any strategic recommendations concerning Westminster, Waterloo and Blackfriars bridges and their approaches and junctions on the south of the river. While recognising the increase in visits due to the London Eye etc., the report woefully fails to respond to the scale of residential and business development that has taken place and will take place in central South London. The neighbourhood strategy must be placed in the context of the Vauxhall, Nine Elms and Battersea development; Elephant and Castle regeneration and Bankside growth. 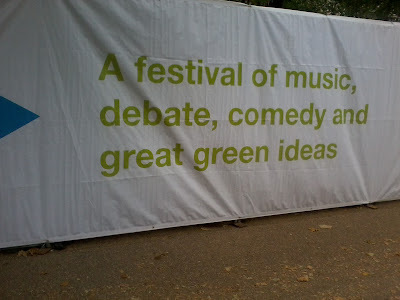 There is also no mention of air pollution or noise pollution, issues in the area that need to be addressed. Reduction in the tendency to use motor vehicles and reduction in their speed is a major requirement to encourage active travel to and within the neighbourhood. London Nautical secondary School on Stamford Street does not actively promote cycling to and from school for its pupils due to concerns about the motor-traffic, particularly along that street and for those pupils living north of the river. It is unacceptable that the draft strategy fails to address these problems. 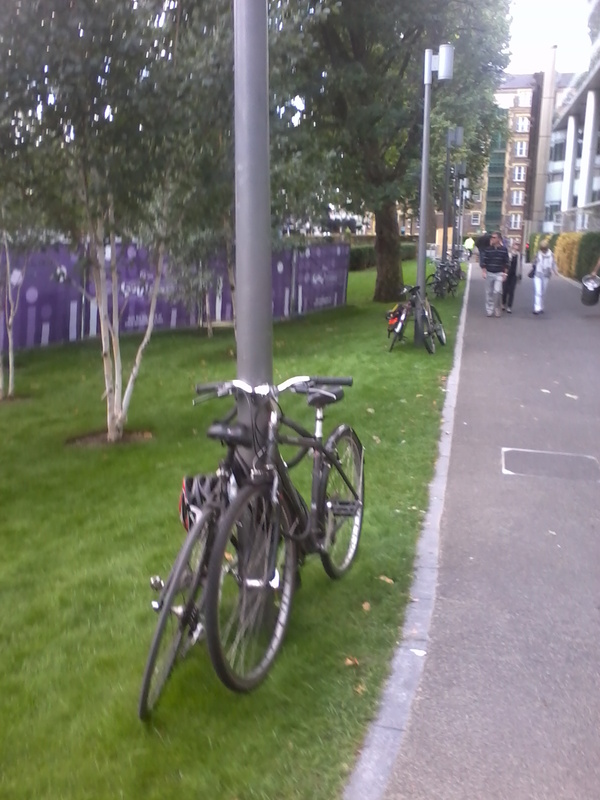 It is appalling that there is not an easy-to-follow, quick, relaxing cycle route with light traffic between St Thomas' and Guy's Hospitals – and again this strategy doesn't offer a way to resolve this, but in fact proposes to reduce options by banning cycling on the River Walk. 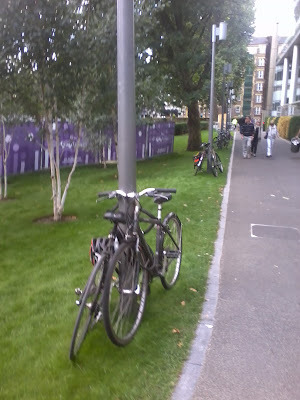 Through improving conditions for cyclists and pedestrians throughout the area fewer people are likely to choose to ride their bike along the pedestrian congested riverside, removing the temptation for landowners to try to introduce a ban with its concomitant costs of enforcement. This allows mellow tourists cycling the length of the Thames to continue to enjoy seeing the sights along the river rather than the road-side wall of St Thomas' and the back of the Royal Festival Hall. a) Make the entire area 20mph – particularly including the bridges and approach junctions in order to ensure cyclists feel welcome within the main traffic areas. Use speed camera enforcement. b) Improve permeability for cyclists by making all local one-way streets (eg Roupell Street, Lower Marsh and Royal Street) two-way for cyclists. d) Reduce the volume of motor traffic on Upper Ground and Belvedere Road and improve the surfacing. Page 29 refers to `the Spine Route' as a service road for HGVs, a bus route, a national and local cycle route and a key walking route but omits to include the large numbers of taxis, mini-cabs, delivery vans and private cars that also use this road, Part of these roads should be made access only for motor vehicles save buses. Taxi drop off and pick up points could be provided along York Road and Stamford Street so taxis needn't use Belvedere Road or Upper Ground. 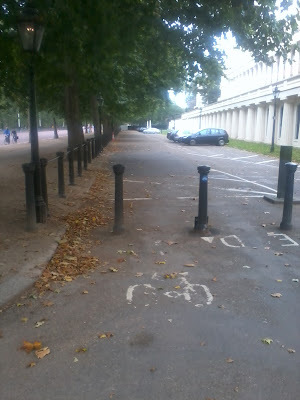 e) Take action against the owners of Belvedere Road behind County Hall for failing to implement a satisfactory traffic management system for cyclists and force them to make changes. 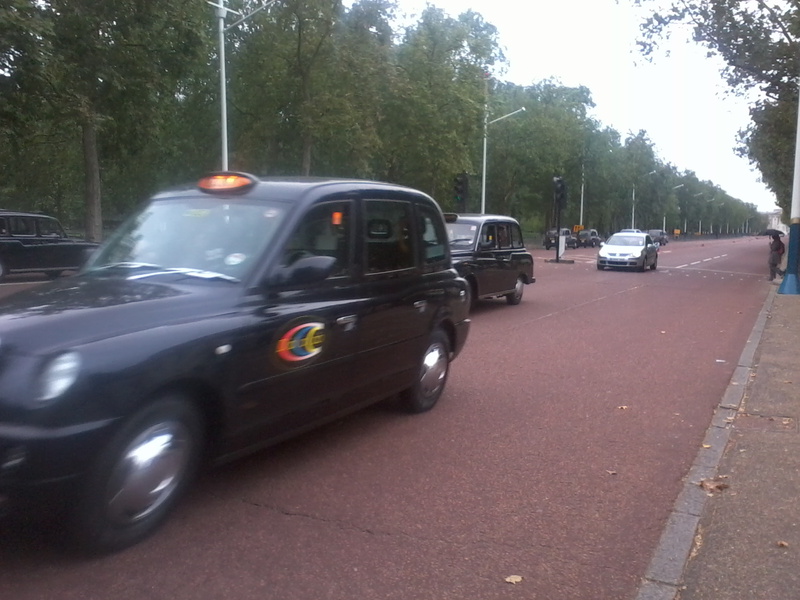 f) Improve the Westminster Bridge Un-roundabout for cyclists. Simplify the lane options, eg through only have one lane turning right to go under the railway line towards Lambeth North. Give it less of a fast gyratory feel through landscaping and speed reduction measures. h) Reduce the number of general motor-traffic lanes going into and around the IMAX cinema. i) Replace the cycle traffic island in the middle of Blackfriars Road with traffic lights allowing a right turn out of Upper Ground for cyclists and cycle lanes. Tidy up of the cycle lane approaches which is currently very confusing and encourages pedestrian/cyclists conflict. We do not support a ban on cycling on the South Bank. 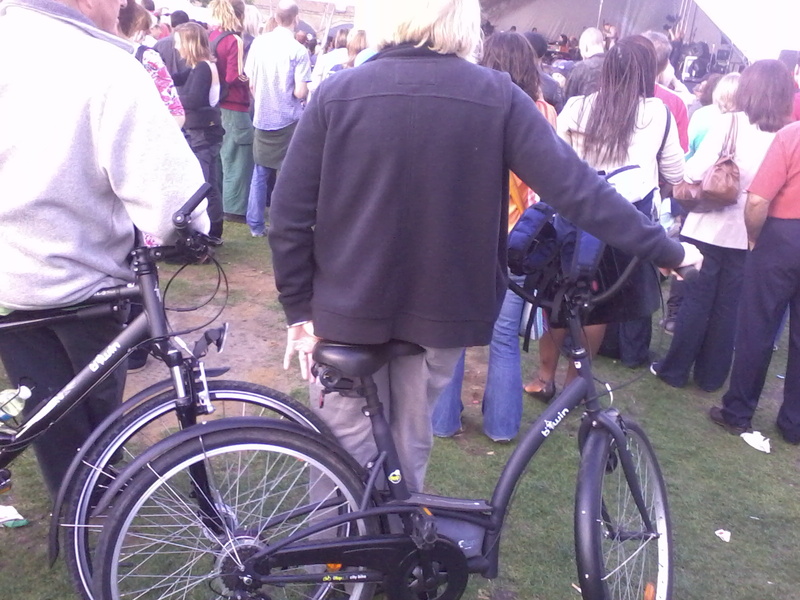 Resources to enforce a ban would be better used to enforce considerate cycling. A better use of resources would be to stop the continuing flouting of the law by ice cream vans trading illegally while illegally parked on the red-route, bus lane and cycle lane on Westminster Bridge. a) Focus on encouraging considerate cycling with pedestrian priority emphasised through signage and education, plus CPSO's picking up on inconsiderate cycling. c) Reduce clutter, especially A-boards, that narrows the walkway. Advice on this issue is set out in TAL 9/93 Cycling in Pedestrian Areas. This emphasises that, on the basis of research, there are no real factors to justify excluding cyclists from pedestrianised areas and that cycling could be much more widely permitted than is current without detriment to pedestrians. This was confirmed by TRL research "Cycling in Vehicle Restricted Areas" published in 2003 that established that cyclists alter their behaviour according to the density of pedestrian traffic by modifying their speed or dismounting. Furthermore, the evidence of the case studies contained within the report shows that very few collisions actually occur between cyclists and pedestrians. It also showed that as pedestrian flows rise, the incidence of cyclists choosing to push their cycle also rises and those cyclists who continue to ride tend to do so at a lower speed. It would be useful if the appendix to the report could include details of the number of cyclists and pedestrians killed or seriously injured (KSI) in the area and the cause. We agree with the points made here, though emphasise that more cycle parking is required in all streets. 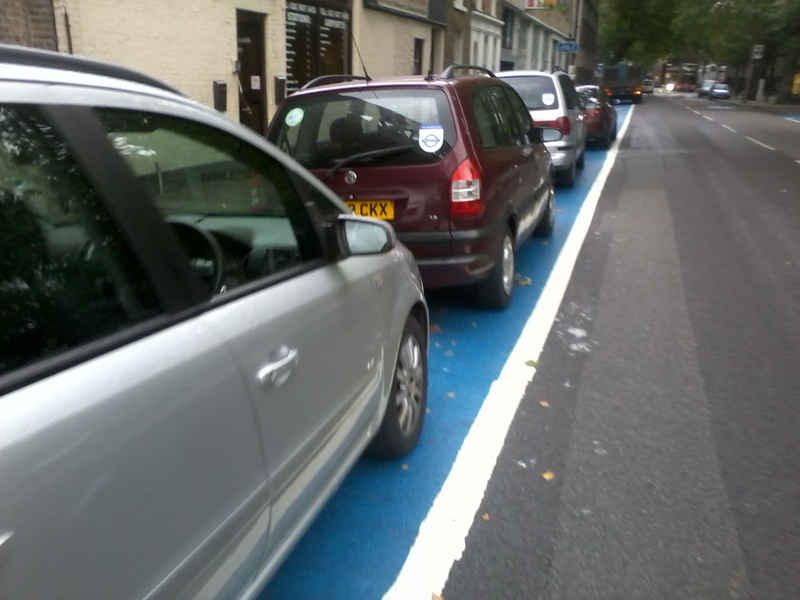 Where possible this should be at the expense of car parking rather than pavement. Pedal Power Kennington, the new community cycling project based in the former Lilian Baylis School, has really appealed to the local teenagers and younger children over the summer. 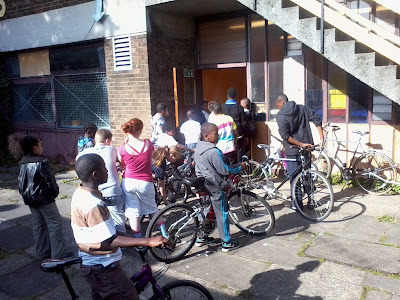 Open a couple of afternoons a week, this was the queue awaiting the mechanics who are helping repair bikes and teaching cycle maintenance. Some work on their own bikes, others on bikes donated by individuals or organisations (including the South Bank Employers Group which has many fine aspects to it). Well done to TfL for providing the funding to kick-start the project and to Lilian Baylis pupils and staff and Citizen Schools for initiating it in the first place. 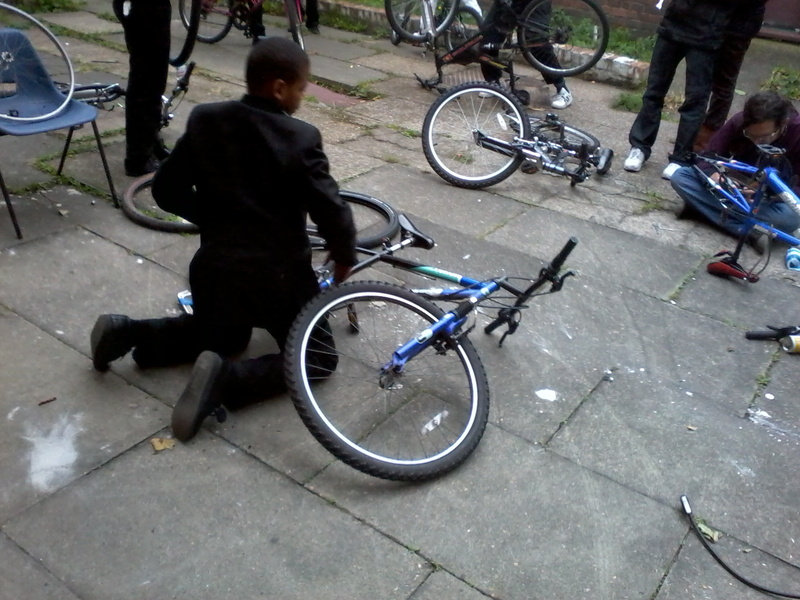 It's great to see more young people riding their bikes more. 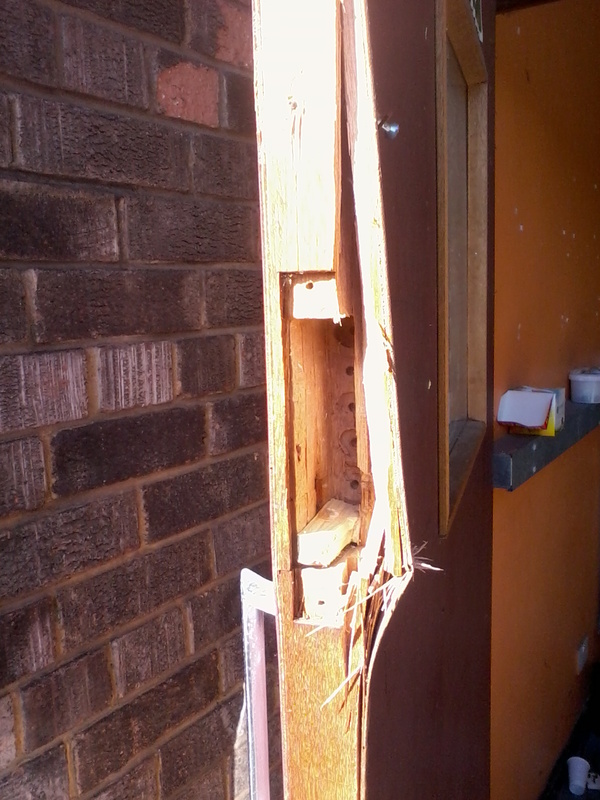 Boos to those who broke in and nicked a few tools and a couple of bikes. ...representatives of the larger businesses that rely on HGVs to transport goods to site raise questions about its specific application to the South Bank area. Network Rail, owner of Waterloo Station, was a member of the report's steering group. 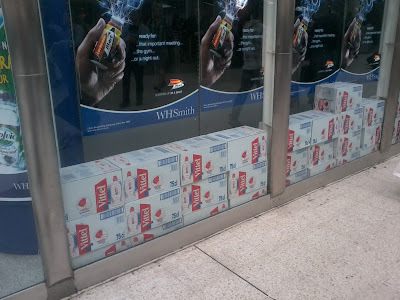 Clearly it is important to keep all the retailers in Waterloo Station stocked with essential products. Just look at the window of that fine newsagents, W H Smiths. Full of essential water driven in by bloody great lorries. 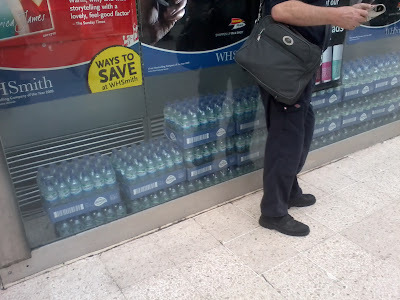 I stopped counting the number of places flogging bottled water in the station when I ran out of fingers, thumbs and toes. I didn't spot a single tap or water fountain for the thirsty traveller so I asked at Station Information. Nope I was told, not one. Nowhere. Network Rail is a non-profit distributing company set up by the Government. So they needn't whinge about needing to screw the planet to appease their fat-cat shareholders. As for the River Walk - there's clearly no rush to fix an existing fountain when the planet killing landowners can extract rent from planet killer stalls and narrow the walkway with yet another A-board into the bargain. 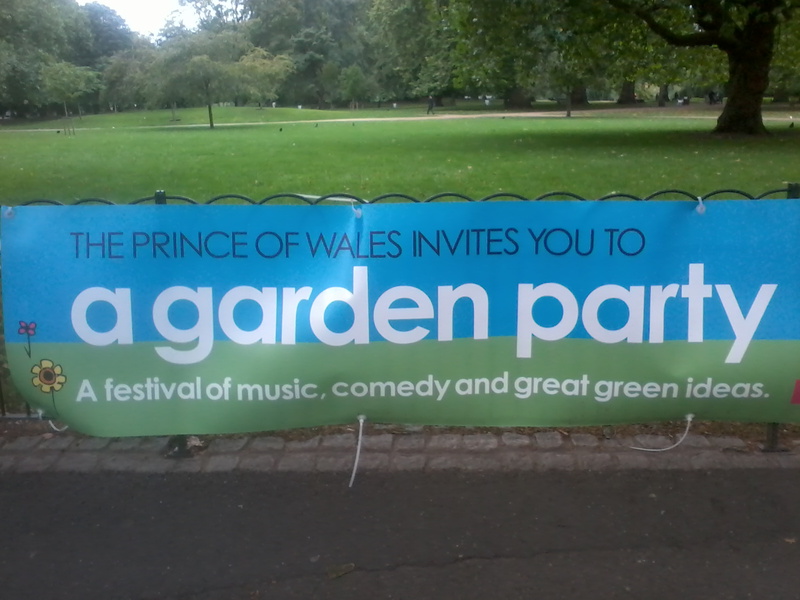 I've blogged previously about Charlie's mum's garden parties that require 2000 parking spaces to be created for the guests to pollute the air around Buck House. 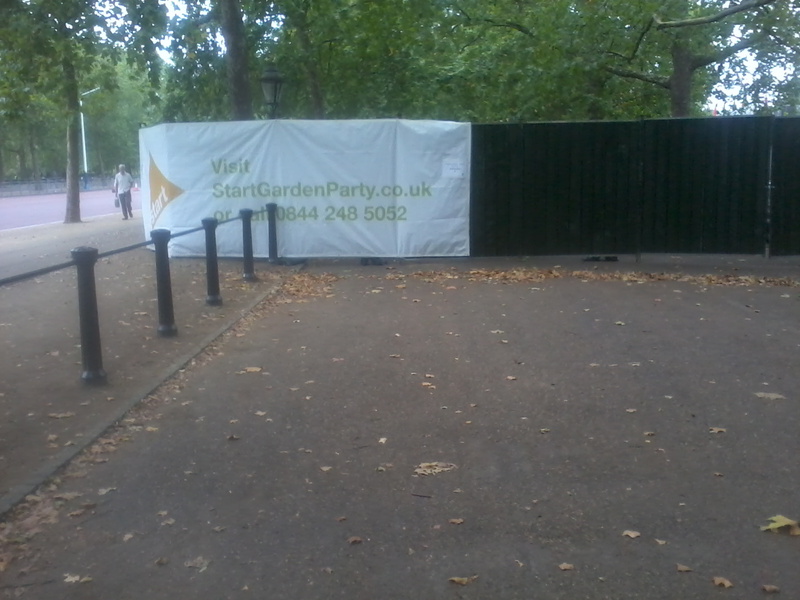 But at least the Queen's bashes don't take over the cycle path without so much as a closure sign and then put up banners on the barriers bragging about great green ideas. The two-way off-road cycle paths along the mall, past Green Park and over Hyde Park are one of London's treasures. Fat Tire Tours have had a bumper season with tourists. They and Londoners alike are loving the ride without the need to mix it with motor-traffic. But for a couple of weeks their pleasure is diminshed by coming across an enormous blockage forcing you to cross the four lane motorMall then cycle along it with the taxis. Now, in a civilised country (which may or may not have a monarchy), the council would insist on a take-over of one of the four lanes to set up a diversionary two-way cycle lane. In Holland a diversion for the cycle lane would of course be provided. Not here, you don't even signpost that the cycle path has been built over let again suggest a detour. More London are one of the river bank land-owners that like to employ people to harass people on bikes enjoying a leisurely pootle along the river. The sensible option would be employing people to deal with people causing an affray. However More London seem much more permissive of people driving cars on their property; this shot was taken while the Thames Festival was in full flow! Sensibly they'd provided pedestrians with Hi-Vis to make them look like the Community Payback culprits that some car drivers deem them to be. More London, proud to be creating more motorists to clog central London and pollute the air. Lambeth Cyclists have demanded another draft is produced of the Southbank and Waterloo Cycling Strategy that Lambeth Council commissioned the South Bank Employers Group to write (our co-operative council??). They claim the SBEG report is weak in its drive to develop cycling, seeming more intent on rationalising cycling in the area. 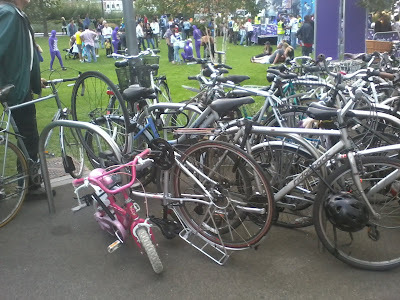 The bicycle is the obvious way of seeing a range of events at different points along the Thames Festival and as a result these photos show the latent demand for cycling that SBEG need to nurture. 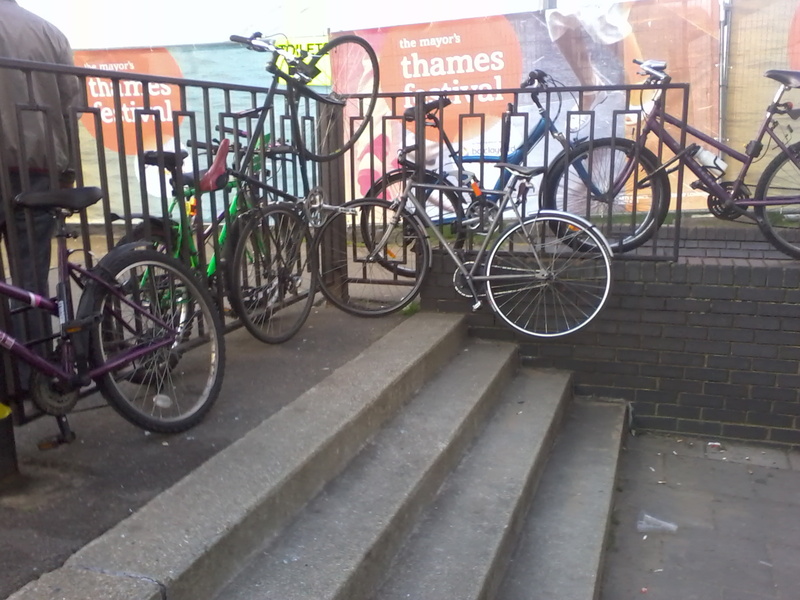 Some people chose not to park their bikes (or couldn't find a bit of railing) and kept their bikes with them. I'll bet at about 7am some even found space to ride along the river front - something the SBEG employers would like to see banned. Needless to say, the Shirayama County Hall's security guards were stopping anyone parking on the odd bit of railings they have and couldn't give a toss that their company provides zero, zilth, nada, no cycle parking whatsoever.